This is an Extra Detail Magnification (or "EDM", for short) of yesterday's APOD. In the night-side of the the so-called "Dwarf Planet" 1-Ceres an extremely bright - and, we have to repeat it once again, mysterious and still unexplainable - series of "White Spots" lay inside an Unnamed Impact Crater (not visible here, because of the deep dakness that covers almost every relief). Now, what kind of Mineral can glow (and this picture might prove, in a "visual" way, that thia aforementioned Mineral emanates some sort of strong luminescence) even during the night-time? Probably - and this possibility should, in our humble opinion, as IPF, be taken into consideration by NASA - we are looking at some kind of Radioactive Material that glows in the dark, partly because of its own nature and, partly because it is constantly hit by Charged Particles (---> Ions) coming from both the Sun and the Outer Space (i.e. : Solar Wind and Cosmic Rays). So, could the White Spots be, for instance, large Crystals of Uranium which are laying, here and there, on the Surface of 1-Ceres? Even this specific frame is just one among the first snapshots coming from Dawn's second Mapping Orbit of 1-Ceres, which is carried out from an altitude of approx. 2700 miles (such as about 4345,218 Km). The Resolution here is roughly 1400 feet (such as approx. 426,72 meters) per pixel. 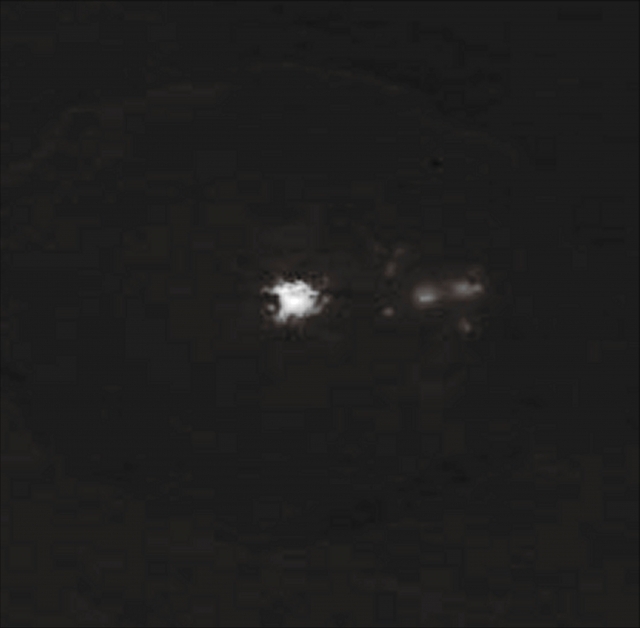 The image (which is a crop obtained from an Original NASA - Dawn Spacecraft's b/w and NON Map-Projected Contextual Frame published on the NASA - Planetary Photojournal with the ID n. PIA 19584 - Dawn Survey Orbit Image 16) has been additionally processed, magnified to aid the visibility of the details, contrast enhanced and sharpened, Gamma corrected and then colorized (according to an educated guess carried out by Dr Paolo C. Fienga-LXTT-IPF) in Absolute Natural Colors (such as the colors that a normal human eye would actually perceive if someone were onboard the NASA - Dawn Spacecraft and then looked ahead, towards the Surface of 1-Ceres), by using an original technique created - and, in time, dramatically improved - by the Lunar Explorer Italia Team.